No mess. No excuses. NO-AD Sun Care! 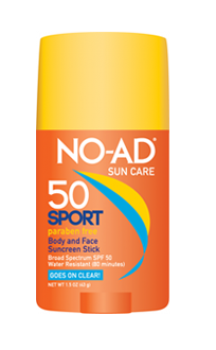 The Body and Face Stick with SPF 50 from our friends at NO-AD is just what you need to protect your skin from the summer sun as you’re out and about doing your TrailblazerGirl thing. The super convenient wide stick makes it easy to cover your body with sunscreen, plus it’s gentle enough for your face. There’s no fragrance and the nonirritating, broad spectrum, paraben-free formula is optimal for sensitive skin. This non greasy, water-resistant protection goes on clear (yippee, no white streaks! ), and the handy stick makes reapplication a cinch, so there’s no excuses not to wear sunscreen with NO-AD Sun Care!